Everlast Blacktop has an outstanding reputation for being the best in the driveway paving industry by many of our customers. Let us show you how a new asphalt driveway or blacktop driveway can add beauty and convenience to your home or business. Does your business need driveway sealcoating or blacktop maintenance? Everlast Blacktop is excited to put our 25 years of experience to work for you. 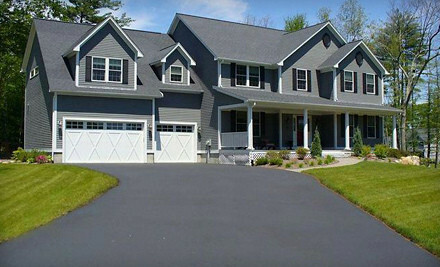 We can help you design an asphalt driveway that is right for you, at a price you can appreciate. We provide long lasting, beautiful and durable driveway paving options that you can be proud of. Call us to schedule your start date today! Located about 22 miles northwest of downtown Chicago, the village of Mount Prospect in Cook County, Illinois offers a newly renovated downtown while maintaining the old village charm. The 54,167 residents of Mount Prospect enjoy access to 400 acres of parks and recreation facilities, all while being less than 5 miles from O’Hare International Airport. Everlast Blacktop understands that long-lasting beauty, durability and convenience are essential to the residents of Mount Prospect. That’s why when they need a new asphalt driveway or driveway sealcoating service they depend on us! Excellent customer service and quality workmanship are the standards at Everlast Blacktop. You can showcase your new asphalt driveway or blacktop driveway after you have our professionals help you with your design. We offer the most affordable driveway paving options in the industry and the highest customer satisfaction rating. Check us out and see why Everlast Blacktop driveway pavers are number one near Mount Prospect. Quality and value are what you will get with Everlast Blacktop. Call us today, we are ready to get working with you! Here is the number to dial (630) 855-5572.